Can you get the mbed ping example to work? If not, where does it fail? Also, what firmware version do you have loaded on the CC3000 (the mbed library claims to need at least v1.11)? Glad to hear it works! You can call the getFirmwareVersion () function in the library to get the version. All the chips on this board already run on 3.3V not 5V. According to the schematic, U1 on this "SparkFun WiFi Shield - CC3000" is a LM1117 3.3V regulator that converts the "Supply Voltage: 4.5V - 12V" to the 3.3 V actually used by the CC3000 chip and the other two chips. If someone adds jumper wire from a 3.3V power source to the Vout "tab" of that LM1117, it looks like this board would work fine (I haven't actually tested this) with any 3.3V Arduino such as the "Arduino Pro 328 - 3.3V/8MHz", the "Arduino Due", the "Mega Pro 3.3V", etc. The CC3000 shield does not have a pin connected to 3.3V, so you would have to solder a wire to the large pin/tab on the LM1117 (as David38 mentioned). The CC3000 breakout does have a 3.3V pin, so you could power it without having to tack a wire to a component on the board. The CC3000 breakout will run on 3.3V. In my experience, the CC3000 is a pain to use in comparison to newer products like ESP8266 Thing or Thing Dev Board, which also run on 3.3V. Correct. The CC3000 uses SPI to communicate, so any microcontroller or microprocessor that can use SPI will be able to talk to the CC3000. The breakout and shield, like you said, just add a few features, like level shifting and voltage regulation, to make it easier to use with an Arduino. I'm having quite a bit of trouble connecting to my house's wifi.. It used to work really well for a while, but now it doesn't do very well. I ran the connection test, and it worked, but when I ran the Web Client example, it stalls at the "Performing HTTP Get of: www.example.com" Must it be a problem with the WiFi? The network works pretty well on my laptop/phone. I'm ultimately using the shield to perform a post to Thingspeak. I didn't change the code that much, but with this code, it doesn't even connect to the WiFi as it does in the Web Client. Any help? SmartConfig not working for you? Do you have a 5 GHz network? This chip is 802.11b/g only, and does not do 5 GHz. Once you get the board connected to the AP, that's actually not an issue at all thanks to mixed mode. However, you cannot use the SmartConfig app from a device on 5 GHz because the CC3000 cannot see those packets, even if it can see the 2.4 GHz channel from the AP. There are possible workarounds, including disabling 5 GHz on the router, or the phone/tablet. Unfortunately, not all devices give you an option to disable 5 GHz (why would you want to, right?). I have possibly the most restrictive combination of devices (iPhone and Airport Extreme) and I was still able to make SmartConfig work using this procedure: Go into Airport Utility, edit the Airport, Wireless, Options. Select the option to give the 5 GHz network a DIFFERENT name (very important that it's a different ssid). Let the router restart. Everything on your network just dropped to 2.4 GHz, even if you don't realize it, because the saved profiles they all have are now for the 2.4 GHz channel only. Run the SmartConfig procedure and it should work. Now go back to Airport Utility and undo what you did, returning the network to the single, original ssid for 2.4 and 5 GHz. The CC3000 still has a saved profile that is valid for the mixed mode network, and all of your devices are back to 5 GHz. Easy! You should be able to adapt this procedure to other types of routers. As a final note, I should say that the real issue here is lack of 802.11n support in the CC3000. The 5 GHz issue is only part of the problem, and potentially you could have an 802.11n 2.4GHz device that the CC3000 still cannot see. Ideally you should force 802.11n off completely to run SmartConfig. However, getting your network to 2.4 GHz is a good first step toward a solution, and worked perfectly for me with no further steps required. Hope this helps someone. I got my shield today and tried immediately. It did not connect none of the connections, I reserved an IP address on the router for the mac address, but nothing changed. I turned on logs on the router (Linksys e2500) and no log record. I use wpa2 so I kept the security setting as it is. I also have a 5ghz ssid and it does not show up. So I did not try test that one. obviously the board works (It can find the networks), what should I do as next step to troubleshoot this? It seems that both of you are having connection issues. Generally, if you can see the WAP with scan (and you seem to have a good signal strength), you can connect to it. It might take a few tries, though. Every CC3000 board that we sell has been tested by having it connect to an access point and ping a remote site. My suspicion is that there is something in the router configuration that does not want to play with the CC3000. You are using WPA2, the correct password, and have it set to DHCP, correct? (Just making sure - it seems that way based on the ScanTest and ConnectionTest results). If you want to see where the code is failing exactly, you can start digging in the library and putting in breakpoints or Serial debug statements. I would start with connect() in SFE_CC3000.cpp. Additionally, there is always the possibility that something got damaged in transit. If you think this might be the case, send an email to TechSupport@sparkfun.com and they can help you troubleshoot potentially damaged components. If it was damaged, they can definitely help you get a replacement. Was there ever a resolution to this? I got a CC3000 board in the mail today and I am having the exact problem. The scan test finds numerous AP's, including my NETGEAR24, but any test that involves connection returns the same "CC3000 initialization complete Connecting to: NETGEAR24 Error: Could not connect to AP Error: Could not obtain connection details Error: Could not disconnect from network Finished connection test" messages in the serial monitor. Iâm really interested in this board, does anyone know if the library / shield works with the Arduino Leonardo / ATmega32u4? I asked about the Adafruit library, but they said that they only had support for the UNO / MEGA, not the Leonardo or Due. They said it had something to do with the SPI pins (for this shield I would have to solder on the ISP pins) - but Iâm not sure. Has anyone tested this board + library with the Arduino Leonardo? I updated the library and tested it with a Leonardo. Seems that everything is working. You definitely need the ISP pins for SPI. Awesome! I really like the idea of using a low cost WiFi chip with the lower - priced Leonardo! thanks! Great write up on the CC3000....thanks for sharing! It seems that I misunderstood how it uses UDP packets for the connection process. There is a mode in SmartConfig for a pre-shared key, and yes, you'd have to enable it in the sketch. I don't have that feature working yet in the library, but I have noticed that if you include TI's AES functions, it quickly eats up a lot of the program space in the poor 328. Hi guys! i'm going to buy this shield, but i don't know if it's compatible with mega 2560. That's why I was asking. I have the cc3000 shield from adafruit, but it's broken and my project need to conect to internet. It should be compatible. Connect the ISP header on the shield with the ISP header (the six pin bundle in a 3x2 configuration near the back of the shield and smack dab in the middle of the MEGA) and they should work as advertised. Oh, and don't forget the SD and CC3000 chip select wires. It looks like they are using D8 for SD card and D10 for CC3000 (which why they didn't use D4 for SD select like the standard Ethernet shield is beyond me). Connect D8 on MEGA with D8 on the shield, and D10 on MEGA with D10 on shield. That was actually the original design. The problem is that the U.FL pigtail had to make some awkward angles to get to the connector and usually just popped off. Is it possible for me to connect to any with this shield? If so, how would I do that? Thank you! So I saw someone else mention in another forum that I can go to network support and have them allow the CC3000 based on the MAC address? Is that feasible? I'm not even sure I understand what the MAC address is/how to connect via that? Sorry I'm ignorant as far as the Arduino goes..
No worries :) a MAC address is hard coded into the network device (such as the CC3000 in this case). So, the MAC address is unique to the device. You can find it by calling the getMacAddress() function. If the network support people are receptive (sometimes they are, and sometimes they're not...can't have everyone adding strange devices to the network ;), you can ask them to add the CC3000 to the network and give them that MAC address. They might not be willing to do it, but it's worth a shot. Thanks Shawn! Another question, I need to get a timestamp using the wifi shield. Can I use Time.h with it? Time.h gives you a way to store time an an easy-to-read fashion in the Arduino; it doesn't actually give you the time. To get local time from the Internet, I recommend looking into NTP: http://playground.arduino.cc/Code/NTPclient. Is there by any chance a fritzing part for this shield? I do not think there is. Sorry! Seasoned wifi shield users: Is this board easier to use than the WiFly shield? I've been using the WiFly shield for some time now and it works great for me. Is this shield any better? Easier to configure, easier to make it work? Any thoughts on this? Thank you in advance. Is this board based off of anyones shield schematic? A simple web server that shows the value of the analog input pins. using a WiFi shield. You cannot use Wifi.h with this board, as Wifi.h specifically supports Arduino's WiFi shield (not the CC3000). You will need to use a CC3000 library (such as SFE_CC3000_Library) to use an Arduino with this shield. SFE_CC3000_Library does not support web servers (only clients) at this time. There are other web server libraries out there that support the CC3000, or you can try making your own. Any suggestions on how to upgrade the firmware on this board? It looks like 1.14 includes a number of fixes for TCP/UDP functionality. Have there been any tests to ensure client library compatibility? There are ways to update the CC3000 firmware. You can follow TI's site here. You will need one of their MSP430 boards. Alternatively, others have been working on ways to update the firmware with Arduino, such as on this blog. I'm having issues...I've got an Arduino Uno R3- this shield is connected on all the headers. I can only see output on serial port if I change to 9600 baud. It seems to work randomly..sometimes in hangs on wifi.init (doesn't return anything), sometimes it hangs on wifi.connect, no timeout error. I've seen it connect a few times, but it's very inconsistent. Smartconfig works sometimes, but I haven't seen it make it all the way through the program - last time in finished all the ping test, but then hung on wifi.disconnect. Any tips? I have had success with the CC3000 and the UNO R3. The default baud should be 15200. Do you have anything else connected that could be using/interfering with the UART? Ok, got 15200 working..just needed to change it in the serial viewer. No, there's nothing else connected to this. I'm concerned that it's often hanging on wifi.init...connection issues aside, shouldn't it be getting past initialization? My router is an N router, but it's b/g compatible (Netgear wireless N). I'm not sure if it's 5ghz, nor do I see any way to turn it off. But before I try to figure that out, I'd like to see this thing initialize more consistently. There's an example called "BoardTest" that just initializes. Give that a shot - that should work almost every time if the shield is connected properly. Shawn, Thanks for the help on this. I tried BoardTest as you suggest. Seems that sometimes it finishes the test and works great, and sometimes the wifi fuctions hang without returning. I see this on all the examples I try..even got SmartConfig to work, and connected to my network with pigs sent & received, but only sometimes. It only works without hanging about 25% of the time. I will run a program, it will work, then I will run again, and it won't work. It seems to have the best chance of working if I disconnect and reconnect the device from serial port/power. Again, this is just a simple Arduino R3 + CC3000 wifi shield - nothing else connected. I have verified electrical connection on all the required connections mentioned in ConnectionTest, namely 5V, GND, 2, 7, 10, 11, 12, and 13. If you can suggest how to troubleshoot this, it would be a great help. That sounds like a WiFi connection issue. Can you run ScanTest a few times and share the results? What kind of signal strength are you getting from your CC3000 to your AP? Note that at first it was hanging, then when I disconnected & reconnected, it seems to work much more consistently. In my opinion, this doesn't seem like a wifi connectivity/network issue. The fact that BoardTest exhibits the same sporadic behavior (and doesn't run any connection functions) suggests that it's a device or PC/device issue. Also, the device is literally sitting next to my wifi router, so I'd be surprised if it's signal strength issue. Other thoughts? Thanks again for your help! The fact that it's hanging at random places makes me think it could be a hardware issue. 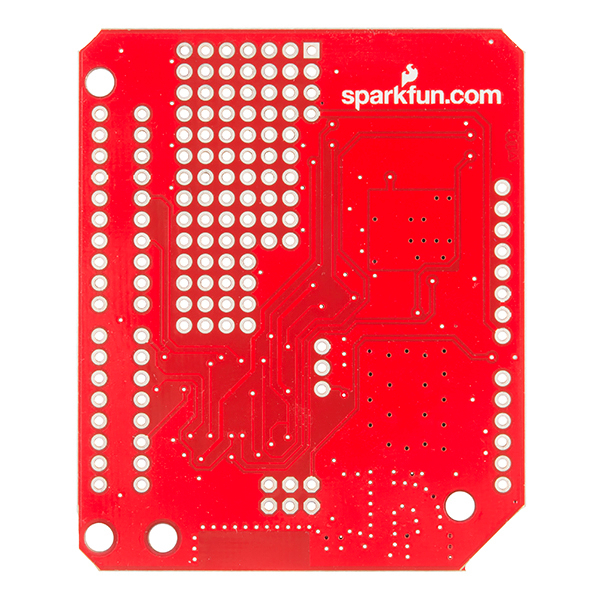 Contact techsupport@sparkfun and they can help you narrow down what the problem is. If youâre eligible for a replacement, they can also assist you with that. 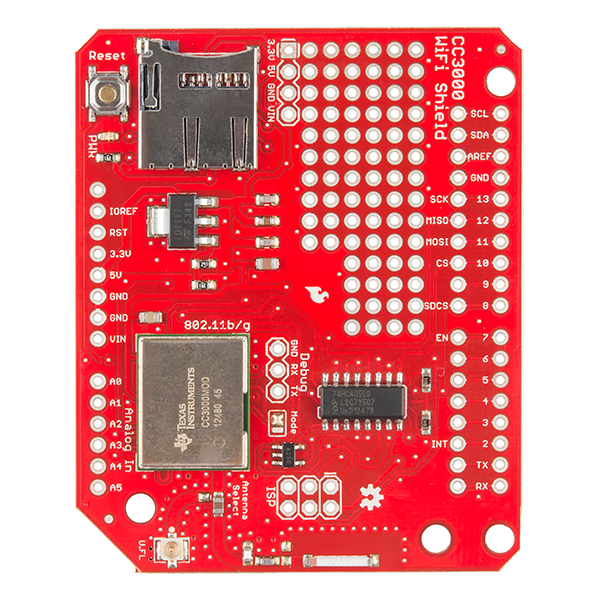 Is there anybody here with a working web server sample, using the sparkfun CC3000 shield? 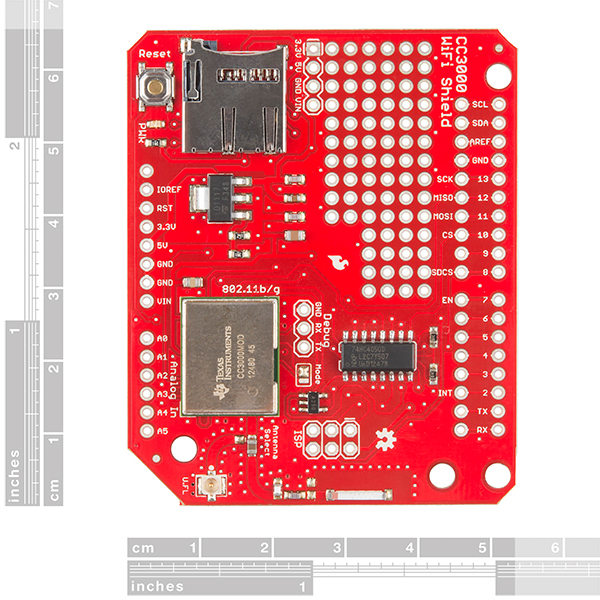 I am trying to get my Spark fun RedBoard to work with this CC3000 shield. But I can not get it to work. When I run the "ping test" to www.sparkfun.com, the ip adress found is 0.0.0.0, but www.example.com works fine. However, when I run the "web client" I only get "Could not make a tcp connection". I have tried connecting to different sites both local and on the internet. Could the problem be that I have not connected the 2x3 ISP connector between the shield and the board? The ISP connector should not be necessary with the RedBoard. When you run the WebClient example, what IP address is your RedBoard/CC3000 getting? I did the tutorial fine, now Iâm trying to post data to a different server. How do I post the timestamp at the time a request is sent? Is there anyway to do it without Time.h (from Arduino) or even better is there a way to do it WITH Time.h , cause currently the SFE_CC3000 library is not compatible with Time.h . Any luck anyone using this for MQTT? I don't know much about MQTT. Is it REST-based? If so, the CC3000 will work. I got the CC3000 working with AT&T's M2X. Thank you very much! AT&Tâs M2X is an awesome service and I'm going to use it for sure, but currently I'm more interested in Lelylan, which improves controlling a device from M2X funtionality. I didn't know about Leylan. That's cool! I'll have to give it a try. 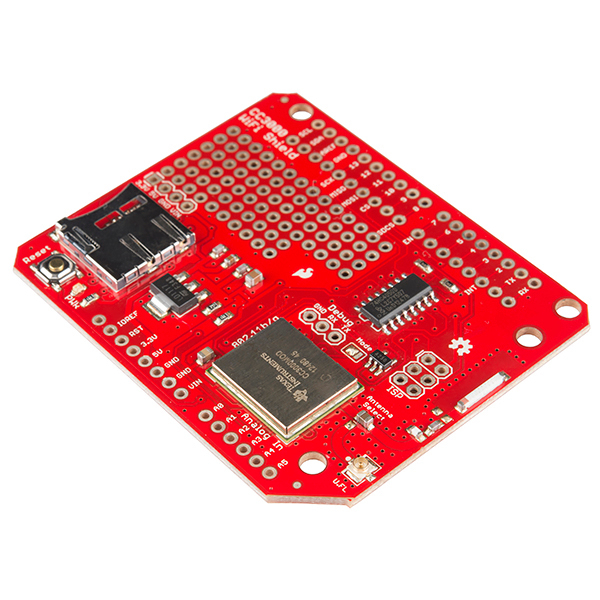 I'm trying to use this CC3000 shield with the RedBoard in a project which also requires a couple of servos. I can get the WiFi to work perfectly on its own, and the servos also are fine on their own. But as soon as I try to both use WiFi and run the servos in the same program, weird things start to happen. Sometimes it works but the servos chatter every time there's a network request; sometimes the CC3000 initialization never returns; sometimes it's just really flaky. I'm thinking the Servo library somehow interferes with the CC3000 library, or there's a hardware conflict somewhere. Has anyone else had this problem? Any suggestions? Are you using a SPI for anything else in addition to the CC3000 (e.g. a servo controller)? I just updated the library, as there was a conflict with trying to talk to SD cards with the CC3000 library loaded. I've heard that there are conflicts with other libraries, as some interrupts do not play nicely with the CC3000 library. Hardware wise, the CC3000 is using pin 2 for external interrupts - I don't know if that affects you. I'm working with an 802.11g router running the WebClient sketch. My phone and laptop can connect to the wifi just fine by WebClient keeps giving me this. I've tried different routers and different settings but none of them work. On the other hand, I am able to connect to my iPhone 5 hotspot. I'm not sure what I'm doing wrong. Some help? 3) What is your WiFi security (Open, WEP, WPA, WPA2, etc.)? Hey Shawn! The ScanTest works fine (I don't have the board on me currently) and lists all the SSIDs that my computer would normally see. No warning or error messages at all. I'm certain the SSID and password are correct, as I have entered the same on my laptop and phone just to check. I've tried switching the WiFi security from WPA to WPA2 but none of them work. Thanks for helping me work this out! When you type in the password, are you using a regular password or a hexadecimal key (it'll probably be 64 digits long)? Also, have you tried the SmartConfig demo? You might have some luck with that, as you are using your phone to send the password directly to the CC3000 rather than through the Arduino. Hope everyone can help me to solve this issue. Are you using an ATmega328p version of an Arduino? If you remove the shield and run the WebClient program, what happens? What happens when you run the BoardTest program? ATmega328p I'm using Arduino Mega 2560 board. Is it ok? When I removed the shield, the result is still the same. And no difference with BoardTest. The Arduino Mega is not based on the 328p - it uses an ATmega 2560 as the processor. As a result, the SPI pins are not on pins 10-13, they are on 50-53, which the shield does not cover. So, you'll need to add a 2x3 female header to the "ISP" port in order to connect to the Mega's ISP port (which has the SPI lines). Additionally, you'll need to update to the newest version of the library - I had to make a fix to allow for non-default chip select (CS) pins (so, yeah, thanks for helping find that bug :). Thanks for your instructions, I will try it now. Hi, everyone, I have some problem, I can initialize Serial Port, but the device cannot Initialize CC3000 and Connect using DHCP I am using souce from example library Anyone can Help? Which demo program are you using? How far are you getting in the program? Do you see "Something went wrong during CC3000 init!" or does it get to "Connecting to: <SSID>" and then it hangs? Yes, the Adafruit library will work with this shield. You will need to change a few of the pins to get it to work with their example sketches. The Adafruit library supports the ability to be a web server, so in theory, it should work. Please let me know if you get it working! Does the CC3000 support Class A subnets yet? Also does it support hidden SSID'S? I've never been able to get it to work on a Class A subnet. I've always had to set up a separate network and make it a class B or C subnet. Not sure about Class A subnets. I have not tried it, and there's nothing in the release notes about it. If you do have any luck with it, please let us know. According to TI's Notes, there's one small peice about fixing an issue related to hidden SSIDs on a specific router. Based on that, I would imagine that it can handle hidden SSIDs. Hi Shawn, wondering why you chose to add the 74125 in your design? Do you mean the 74HC4050? If so, that acts as a 5V to 3.3V level shifter. The CC3000 is not tolerant of 5V logic. I see the 74HC4050 as a level shifter; I am wondering about the 74AHC1G125 between the CC3000 SPI out and the uC MISO ? Is this in case there is more than one SPI slave? While I'm here, also wondering about the use of two ground planes? I am thinking about building my own single-sided CC3000 board, and wonder if I can get away without stitching around the antenna area. The 74AHC1G125 is indeed for allowing the CC3000 to work with more than 1 SPI slave. For some reason, TI does not tri-state the MISO pin whenever CS is asserted, which can (and does) put out garbage on the MISO line when you're trying to talk to other devices. The 74AHC1G125 is a band-aid that tri-states the CC3000's MISO pin whenever CS is held low. If you're doing your own layout, I recommend carefully reading TI's datasheet: http://www.ti.com/lit/ds/symlink/cc3000.pdf. While you'll probably get away with only 1 layer, TI highly recommends having a ground plane under the CC3000 and antenna feed line (I'm not an RF expert, so someone with more RF expertise would probably have a better answer as to why). Ah, I assume you are referring to this: "For best results, the RF trace ground layer must be the ground layer immediately below the RF trace. The ground layer must be solid." That's correct - I'm guessing you also saw their pictures of suggested layouts. I've used both and can't complain about either. Thanks Shawn, I'll consider those, but I want to make sure I have a working protoype before I outsource boards. You've been very helpful, I appreciate it! Hi again Shawn, just wondering about something on your board. I'm done with my design, but wondered what steps you had taken to ensure 50 Ohm impedance on the RF trace? TI recommends doing microstrip calculations. Your trace is 48 mils wide, which for 1Oz FR4 results in ~0.7mm thickness. I am trying to find the right compromise; a 0.8 mm thick board gives me a 56mil trace! In short, what thickness is your board (and weight?) and how critical, as far as you know, is getting the impedance spot on? The CC3000 boards use 1 oz copper. And like you found, I definitely followed TI's recommendation for microstrip calculations. However, to get a 50 Ohm impedance, I really should be using a 0.118" thick trace (!). Since that's not feasible, I made it is wide as possible and short as possible to connect the components. It resulted in about 88 Ohms, which isn't ideal, but gets the job done. Good stuff! Thanks. I was worried I'd have to use a 0.6mm thick PCB. What CC3000 firmware versions does the SFE_CC3000_Library support? No headers and no jumpers to work with the SPI bus on the mega? I know this is only a personal opinion and I love spark fun I just ordered 2 orders from you in the last month =) but I think this is lacking the competition this time around. Actually I appreciate the fact there are no headers. I spent hours pulling the headers off of some Ethernet cards when I needed to wire directly to an Arduino MEGA without stacking them. I agree I don't like them populated on the shield but I still like them included in the box/bag. Hey TatakaWilly.... I am able to coonect with he sample "ConnectionTest" sketch. Do you have a sample web server sketch, by any chance?..... I have been looking around with no luck..
What is the incentive of using this over the Yun? Would this shield make it possible to reprogram the arduino over the air? As it is, it cannot. The CC3000 uses the SPI bus, and Arduino programming happens over UART. However, it is possible to create a bridge (from another Arduino, perhaps) that takes in SPI data from the CC3000 and uses it to re-program your target Arduino. "Eagle Files" link is incorrect, points to the same schematic PDF as the first link. Please fix? Ahhh, so Sparkfun is the reason why the TI boosterpack is out of stock everywhere !!! YOU bought all the modules!!! Please make and sell the little laser-cut adapter for the external antenna. I'm sure it would be useful for other things too. 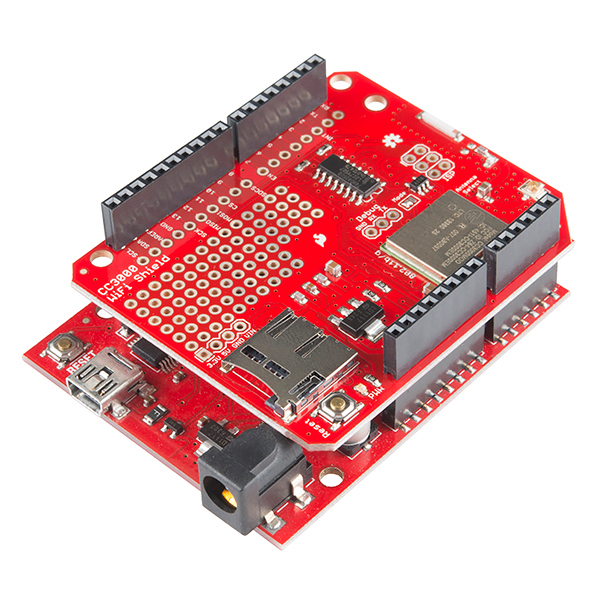 hey It is great to see CC3000 under sparkfun finally.... I am wondering how do you process reflow soldering for this specific component like CC3000. Because reflow soldering of such larger component with LGA and metal cover is very different from "black components" with extended legs. How do you set temperature profile for Oven? Would you like to show us about soldering from your production team. A 3 min video would be great for it. I'm a bit confused by your spec's above. It appears your supply Voltage in straight from the data sheet of the CC3000. Since you are using a 5-3.3V LDO shouldn't you supply voltage for this board be based on those numbers. With that said shouldn't this "Shield" be capable of over 5V in? and not 4.8? Looking at the data sheet of the LDO it is rated for up to 20V max 15V recommended max, and your shift register should be good for 5V tolerant pins such as a standard Arduino. So, it sounds like the fact that you're not stocking (at least at the moment) that pigtail to a "normal" antenna connector a moot point. I'll stick to using my "stupid" phone and spending the money saved on other electronic toys. There's a Java applet as well as the phone app. In addition, you can set your SSID and password manually through your Arduino program. You don't have to use the SmartConfig process. Don't be silly. You can get a used iPhone for $150 or less, and it doesn't need service to configure your CC3000. Heck, what's your address? I will give you an old Android Phone. There are also some decent companies out there that offer cheaper cell phone options with a smart phone. Republic Wireless (which I use) could get you going for $10 per month with unlimited voice minutes, and your current usage rate would cost you about $9 on Ting. No one says this "TV costs me $3000 because I need to pay for cable." Why do people do it for phones? You could also run android on a virtual machine on any computer you own with wifi and install the app, if the app really is the only or best way to configure the device. The shield has a dual parallel header row for all the digital and comms pins passed up from the Arduino and the INT, EN and CS lines are hardwired to pins 2,7 and 10 respectively. To solve the issue: I installed stack-able headers on the outer edges to match the footprint of the Ardiono and a male header in the parallel header row. I installed a stackable 3x2 header on the underside of the board in the ISP header so it plugs diretly into the ICSP on the Arduino board so that MISO, SCK and MOSI gets connected via this route. I cut the link tracks between the parallel header pads for the SCK, MISO, MOSI, SDCS, EN and INT lines so I can assign them to what ever I pins I want. As soon as I assigned INT, EN and CS to Pins 3,22 and 24 respectively the module started working. I suggest an upgraded design which includes a 7 bit dip switch that allows the user to disconnect any of the hardwired lines between the two headers as they wish, or at least 0R jumpers that can be removed if needed. This will make for much wider compatibility across the different Arduino boards. The shield is working as expected, but it doesn't fit well over an Arduino Uno R3. The shield is ~1/8" too long on the left side (side the SD card reader is on) and that hits the USB and power jack of the Uno such that the shield can't sit flush to the Uno's headers. Still, the Stackable Header Kit (PRT-11417) pins are long enough to allow for this flexibility, it just makes the shield+Uno connection a little wobbly. I am trying to use a RedBoard with Blynk and the CC3000 shield, and it drops connection after a matter of minutes to hours. I've been working with the Blynk community and their consistent advice is to avoid the CC3000 because it is just not stable for long-running projects. I'm fed up with tweaking my code, searching for workarounds, and delving into the fine details of this board. It just isn't stable. I was pleased at how easy it is to get the WiFi talking to the access point. Beyond that, I still have not figured out how to modify the usage. For instance, I want to perform peer-to-peer linking. I am slowly getting the impression that it can't be done, but I'm not sure yet. I am using the CC3000 board as a platform from which I am able to connect my Arduino Mega( which has various sensors attached) to my hosted db. The data is then processed and displayed on my site. So far the CC3000 has performed well with the exception that I thought the on-board antenna would be more powerful than it is, having read the board description on its web page. I had to buy an external duck antenna in order to make wireless connections that I am able to make with my Sammy phone, tablet, and Dell laptop. I really thought the board should at least be able to equal the wireless connectivity capabilities of those products, as it is to be used in similar connection situations. Also, I would like to see better documentation on the library functions. I am somewhat new to programming in the Arduino 'verse, including all the associated microprocessor add-on devices like the CC3000. I guess I should say I am not so familiar with C++, or C. I use PHP, JQuery, and the other usual Web app languages. For me, better library documentation would go a long way - time I have to take looking at functions to determine what is going on is wasted time, it's more like reverse engineering than being able to read a well documented API, take Java as an example. Having said all that, maybe I am missing the boat on some good documentation!! If there is some good stuff out there could you please point me to it? Overall I am happy with the board, perhaps it is just my ignorance and inexperience with the platform that has me grousing! One thing I would like to say is that so far my experience with customer service has been VERY good! Some of the best in the industry! Excellent product, works as advertised once I found the correct connections for use on an Arduino Mega. I was able to get this shield up and running super quick. After a bit of work getting it to connect with my WiFi, I was able to push sensor data easily to data.sparkfun.com. Very easy to use!